Today I am grateful for endings and for new beginnings. I am a bit subdued, feeling like an 18 wheeler got the best of me. But thanks to Josie for her faithfulness in keeping this blogging challenge GOING! One. This migraine headache is finally relinquishing its hold. I spent yesterday huddled in the darkness as my dearest widower brought me ibuprofen and Tylenol. Yet another side effect from yet another statin drug. Coming to an end, right? Two. The necessary roofing repair, with its pounding and ladders and men of integrity, is also coming to an end. I’ll miss the way they hung around…. Three. We are finally tackling some overdue home repairs and cleaning. The roof rot (above) was a serendipitous discovery after pressure washing the house. See? My pressure to get the pressure cleaning was a good thing! I should remind my dearest widower. Four. The clutter in this house is coming to an end. Baby steps. No, tweener steps. Five. Our hot and humid summer is gradually coming to an end. Temps dropped to the 80s this week (just for a day or two) and many trees are cutting their losses, with yellowing leaves gulping for water. Six. The new school year starts tomorrow! My dearest teaching widower calls it the Great Everson Giveaway. I wonder why he’s never as excited as I am. Seven. More awesome professional development classes start soon! My dearest teaching widower asks me if this is what other “retirees” do. Eight. The fawns that have been parked on our hill are following mom to sample treats in other folks’ yards. I know they will be back. This evening. Nine. My dearest widower is shopping for clothes right now! On his own! Maybe this is the start of something new. Maybe he’s an imposter. He doesn’t think a shirt should cost more than $12. Yes, it’s been that long since he ventured into a mall. If I didn’t have such a headache, I would have accompanied him to immortalize the expedition with photos. Is this the end of online shopping? Nope. Ten. I will copy The Wakefield Doctrine and leave this one for the special day when I don’t have a headache. Whee! The kiddos are here, 8 of them tonight, playing on various devices and eating endlessly. I’m grateful for their humor (“I’m just teasing, Aunt Katharine”), their enjoyment of one another, and all the Beatles’ songs we’ve heard tonight. One niece has perfect pitch, which is truly amazing to a tone-deaf person like myself. We are far over the year’s average of rainfall, which keeps all the plants growing so deer can snack on the yard. I call it The Dead Man Theory, as my dearest widower could step over a dead man on the kitchen floor and not notice. The good news is that he has never once been critical of my multiple stacks of paperwork. I have not been as generous towards his debris. I’ve been given some awesome chocolate this week. Ooh, pure pleasure. We had a fabulous women’s event last night at church. Designer desserts, candles flickering, a jazz trio humming. Wow. I still have more chocolate to eat!! My foot is healing well. It could have gone south, but that compression boot and tons of prayer did the trick. I saved the best for last. Tomorrow is Father’s Day and I am married to the best father I’ve ever met. He is gentle, patient, wise, and unselfish. Wait! Another one! Speaking of patient, my dearest widower stopped the car so I could take a photo of a most beautiful sunset. Sadly, my iPhone doesn’t capture the gorgeous colors, but who gets tired of admiring sunsets? It’s bad news, good news this week. #1. Bad news: After a loooong week, I have been working on paperwork most of the day and my eyes are swimming. Good news: I finished a lot of it! #2. Bad news: I lost October 2016. I mean I lost my lesson plans for a student. I have the digital version but no notes. Good news: I found October! It was just incorrectly stapled. More good news: I threw away some clutter in the hunting process. #3. Bad news: I have not been able to wean my foot from the compression boot. Good news: I said, “Whatever!” and tossed the heavy thing aside. More good news: My foot has been fine all day. #4. Bad news: I did waste a little time playing Mahjong today. Good news: I beat an expert level that had defied me for weeks. Yes, the game was taunting me. #5. Bad news: I did not get much accomplished with my online classes today. Good news: Tomorrow is another day. #6. Bad news: My dearest teaching widower had to work all day, too. Good news: I was able to help him on a project without getting snappy. Oh, right, I never get snappy. #7. Bad news: I lied in #6. Good news: I only lied about never getting snappy. I really did help him without getting snappy TODAY. And I am running out of news, folks. #8. Bad news: There is no sequel to the sequel of The Dying and the Dead. Good news: Sequel #1 was great and featured a brave young boy. #9. Bad news: I may not finish the Color Your World blogging challenge. Good news: I can try again next year. More good news: I have a whole year to take more colorful photos! #10: Bad news: I have nothing else to add. Good news: I did not gripe about the clutter in the house, the laundry that needs to be washed, or the pile of mulch in our driveway that needs to be spread somewhere, anywhere. More good news: I am reading a cool detective thriller called The Murderer’s Son by Joy Ellis. A terrific read about a guy who thinks he is a serial killer. Is he? I don’t know yet but it will be fun to find out. Mama was the Blonde Butcher. Oh dear, what a legacy. Have a great week, dear readers! Who is Josie Two Shoes? I first crossed paths with her a couple of weeks ago as she hosts the Ten Things of Thankful (TToT) blog. TToT introduced me to a sweet group of bloggers who share their stories and encourage me to focus on the positives in my life. I wondered about this Two Shoes who inspired other kind folks to respond so thoughtfully to my own meager TToT contributions. My search for Josie Two Shoes was on! Her blogger profile explains that a new chapter of her life started in 2007, when she declared that she was now standing on her own two feet. That led me to her blog, where I discovered that she is also a writress. A really good writress. Wow. Josie completed the A-Z blogging challenge by writing, and I quote: “a serial story in six-sentence segments involving twenty-six women living in the small Midwest town of Cottonwood Creek, their lives connected by the Women’s Circle of the town’s protestant church, Hope Christian Fellowship, to which they all belong.” Talk about clever and intriguing! By following Josie’s footprints, I discovered her Facebook page. I was struck by Josie’s focus on being kind to yourself and others, not letting those stumbles and bumps define who you are. I could have clicked “LIKE” on each post! Josie’s shoes then led me to her Twitter account and from there, back to her blog, where I savored some of her writings on faith and the miraculous. If you are looking for a place of encouragement and inspiration AND a safe spot to share your writing with others, follow Josie’s Two Shoes. You’ll end up with a smile on your face and a polished pair of two shoes! 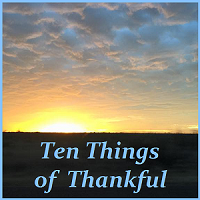 In case you’re wondering what that odd title means, this is my Ten Things of Thankful post and I am using the letter D from the A-Z blogging challenge (yes, I have skipped C temporarily). Be sure to check out Josie Two Shoes’ post and links to others who have posted their own Ten Things! Delightful, deer-proof flowers, waiting to replace the not-so-deer-proof stubs. Dearest teaching widower shoveling a place to plant the new flowers! aDorable sage meadow that smells pungent and hopefully unattractive to Deer. Detritus from our neighbor’s huge sweetgum tree. Love the tree but can live without the pods! Don’t Break the Ice Game, perfect for Fun Friday with a special student! Doodads in my hair for Wacky Hair Day at school this week! Delicious and nutritious snacks- yum! DUH! My son had to help me with Algebra 2. Thank goodness for a math-savvy family! I haven’t tackled the challenge to write Ten Things of Thankful in months, so I reread Lizzi’s Christmas list of 50 things, which amazes me (but not enough to copy). Let’s see how far I can get…. I am feeling a bit better today! Still shaky but this round of steroid withdrawal is losing its power to flatten me. My dearest steroid withdrawal widower has been tending to me so carefully, encouraging me that this will pass. What would I do without his love? Rationally, I know that the flattening and disgusting side effects of withdrawal are far better than something like chemo. I do not have cancer; I’m not facing that dreadful siege. My heart aches for those who are in that battle. My broken foot, still encased in a boot, no longer objects to an occasional free step. In 2 weeks, I’ll know whether it can fly out of its cocoon. The local (pricey) swimming pool is sending out teasers suggesting that we may be able to swim there again, after months of locked doors. Vance, the Venus fly trap, continues to sprout new traps, ever hopeful that the spring will bring a random gnat into the house. Of course, I am just boarding Vance for his student-owner, whose house must be kept like a refrigerator. I’ve just started a MOOC course on Mathematics and Technology through The Friday Institute. After reading through the profiles of all the participants, I can see that I am on the lowest percentile regarding middle school math skills. I do love a challenge. It’s not too late for you to sign up, either, no matter where you live! Cool! We are hosting a Korean zombie movie night this evening. Train to Busan, with Korean food and sweet guests. I HOPE I can rouse myself out of bed! A dear friend (who now lives far away) has a birthday today. I owe her more than I could ever express. I have read about 20 books in the past few days. It’s been a wonderful way to escape from bleh and blah and worse. My faith rests in the confidence that I am being held, not that I can hold on. I’ve been able to eat chocolate throughout this temporary ordeal. I assume that is related to #11. Lizzi has written a powerful message on legacy, as she and her family bid farewell to their Nana. I can’t adequately capture Lizzi’s passionate writing, so please head over to her blog and read for yourself. Lizzi concludes her post with these questions: What would you like to be remembered for? Have you ever wondered about life, whilst commemorating its passing? Who makes you thankful to be alive and learning? I want to be remembered as a lover. A lover of Jesus, first. A lover of my husband. A lover of my relatives and my church family. A lover of thousands of students. I do wonder about my eternal life and especially the new earth. Will dogs and cats be able to speak? Will I be able to stay next to Jesus while I also explore the galaxies with my dearest widower? Can I re-negotiate the marriage deal then? I never want to be away from my dearest widower. Will there be toilets and will we need them? Who makes me thankful to be alive and learning? God. If not for his intervention, I would have died in infancy and many times after that. I’ve experienced a multitude of brushes with death, and here I am, by his grace. If you do not have this faith, I sound stupid. I used to tell a therapist (who did not have this faith, either), that religion was a just crutch for the weak. I mocked anyone who believed in God. The name of Jesus made me sick. How could God allow the destruction of my soul? Where was he during all those dreadful years? Now I acknowledge my weaknesses and ask, “How could God have redeemed my soul and saved me from death? Why me?” Now I know where he was and see what he was doing. It makes me want to shout for joy!